I've been interested in this book since I first saw it at the NCW studio and finally picked it up at Wine and Words recently. Most of all, I wanted to know what Tao is, what it means. The author, Ralph L. Wahlstrom, says, "Tao means 'the Way,' and it reflects a particular interpretation of the ways in which the world and universe work." So, how does this apply to writing? The Tao describes to us a world of balance and flow. As a writer, that sounds more restful than rigorous, more natural than forced. I feel I've been in this Tao place before and would love to get back there. Traditional approaches to writing, of course, have their well-earned, time-honored place. But, consider what Whalstrom's book tells us: "Traditional writing instruction is the antithesis of the Taoist ideal. It is a painfully rigid, rule-bound system that has teachers and students imposing structure on ideas and forcing topics into structure." I'm beginning to understand how this relates to me and what I might do to unlock the box I've stuffed my writer-self into. Not comfortable in here. My Tao writing will begin today, and my words will flow freely again, revealing the story to me as I float along. I will build the traditional damns, or rather dams, later on. 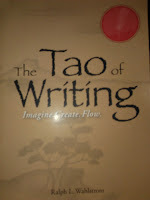 loved this book, am a fan of 'The Tao' in general, not just writing. I saw an great example of this today at the Windsor fine arts fair. The Tao is...write with it in your soul.